First Reformed has 285 years of history as a community of faith. 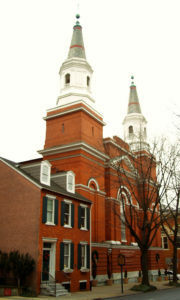 The current church was built in 1852. A Commitment to Community capital campaign was conducted under the leadership of Kirby-Smith Associates to renovate the kitchen facilities to provide meals for those in need and homeless in Lancaster, PA. Today, First Reformed has renovated facilities and a new fully functional commercial kitchen providing hundreds of meals to those in need, an important ministry of First Reformed and a vital service to the Lancaster community.